The Arms Trade Treaty: a work in progress? The UN Conference on an Arms Trade Treaty ended on 27 July 2012 without an agreement. First the USA and then Russia asked for "more time" to consider the draft treaty text. In consensus negotiations, with the world's two biggest arms exporters not ready to adopt the treaty, and several others opposed to any provisions with real bite, its fate was sealed. That does not mean it's the end of the road, however. One possibility may be to force the draft (or an improved) text through the UN General Assembly either this year or next. Another, potentially better way would be to conduct new negotiations outside the UN and adopt a more meaningful treaty at a specially convened diplomatic conference. But whatever approach is chosen, the good work by NGOs and states should not go to waste.  For further discussion see the Geneva Academy's blog on the discussions during the UN diplomatic conference.